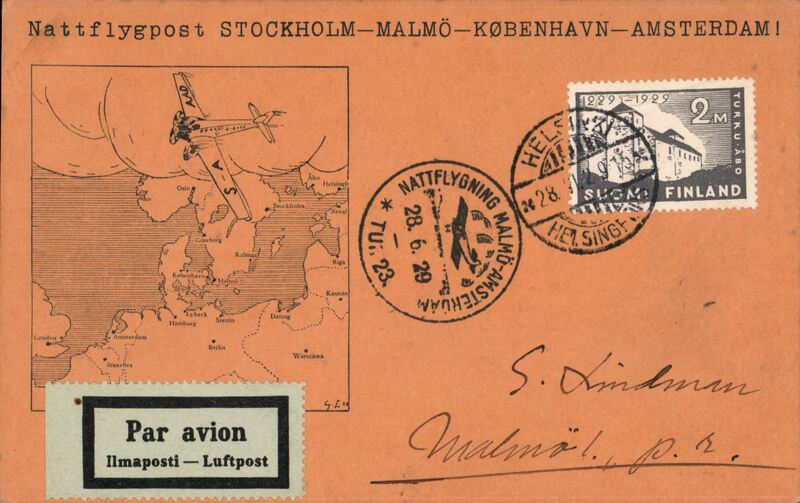 Scarce Finland acceptance for the F/F Stockholm to Amsterdam night time service Mu 81, printed orange/black souvenir card with map, franked 2M Finland canc Helsinki 28/6 cds, also special black circular flight postmark. Image. 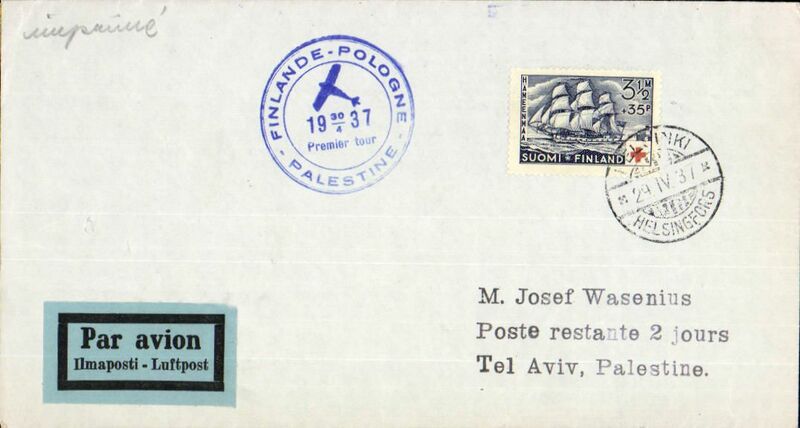 Aero Osake Yhito/LOT, F/F Helsinki to Tel Aviv, bs, via Warsaw, plain cover franked 3.5M, blue cicular flight cachet, black/green airmail etiquette. 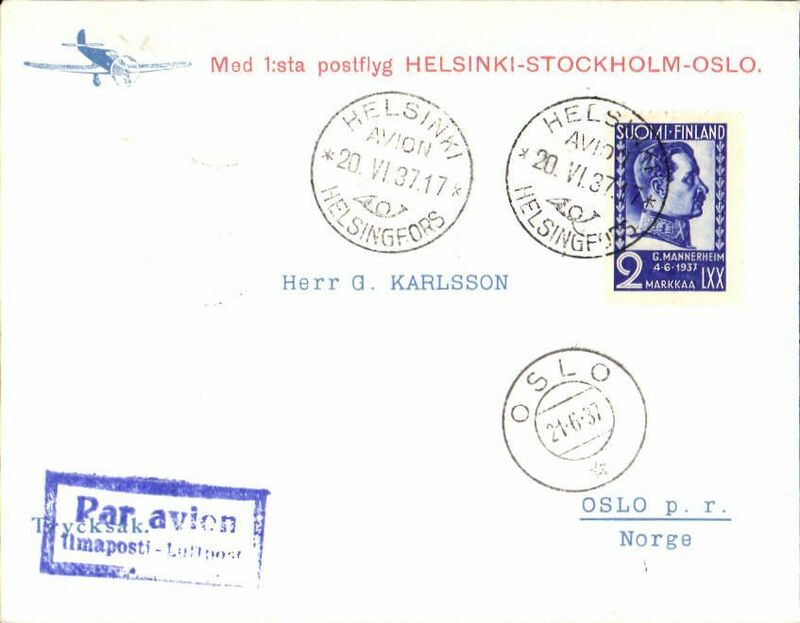 F/F Helsinki to Oslo, r21/6 arrival ds on front, red/white souvenir cover franked 2M, postmarked Herlsinki Avion 20.VI 37 cds, special Stockholm transit ds vberso. 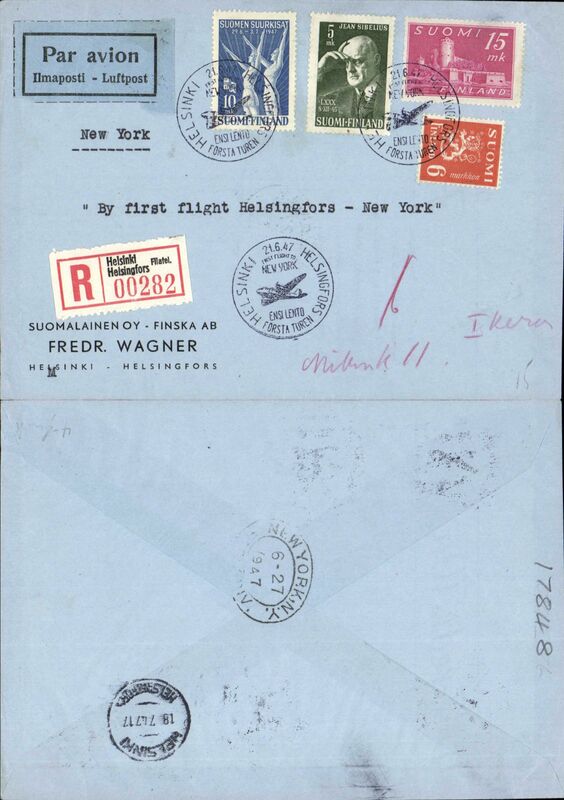 Finland to USA, early WWII censored air cover, Vasa to New York, no arrival ds, plain cover franked 9.7m, via Lisbon 14/10, black/light blue Finnish airmail etiquette rated uncommon by Mair, dark blue Finnish/Swedish double circle censor mark, and nice strike scarce purple boxed "PAR SERVICE AERIEN TRANS-/ATLANTIQUE EUROPA-ETATS UNIS" directional hs.. 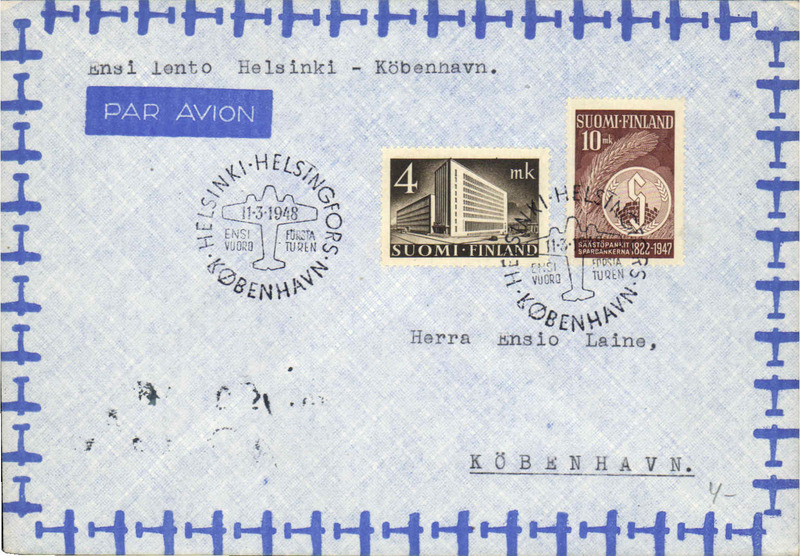 This cachet was used originally on Finnish airmail sent on KLM via the Stockholm-Amsterdam-Paris route for OAT on FAM18 via Lisbon, see Boyle p340. 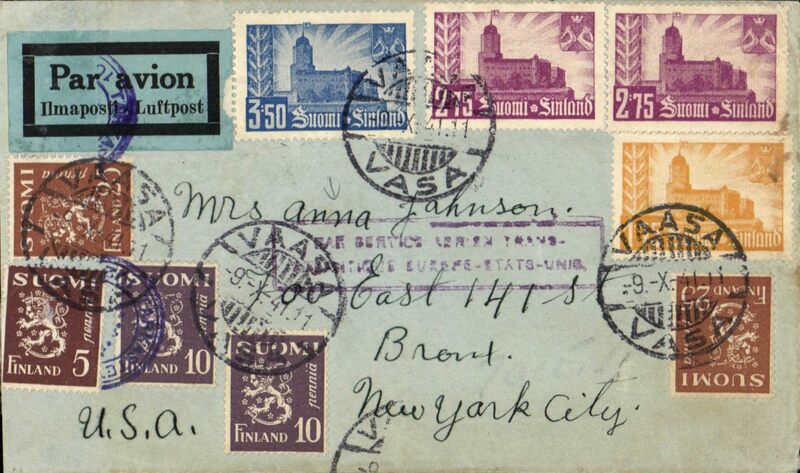 No airmail acceptances for North America at Finnish PO's between Dec 1941 and Sept 1944, see Boyle page 340. 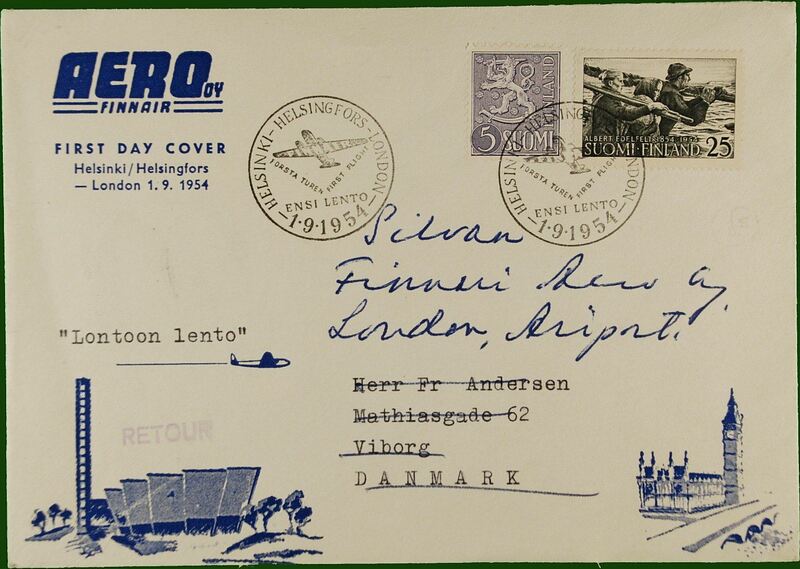 A scarce WWII item with fine routing. 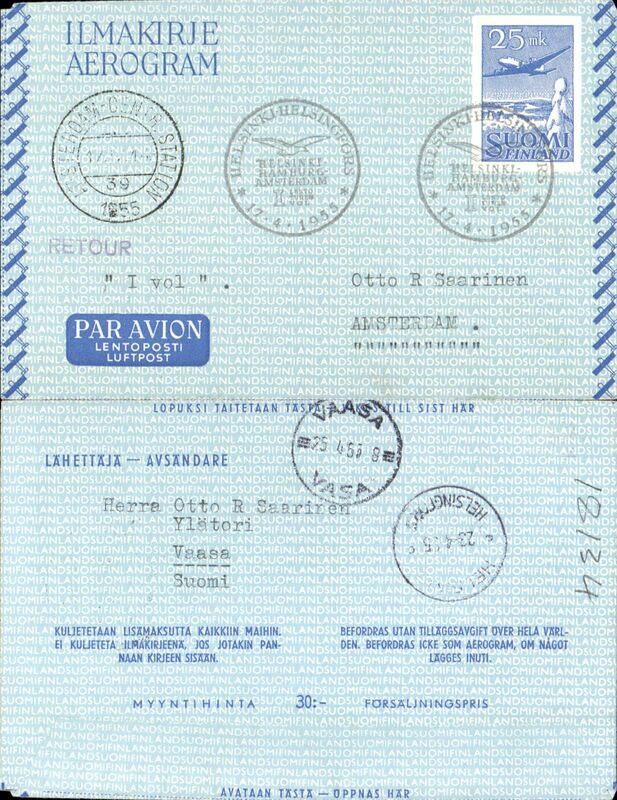 American Overseas Airlines F/F FAM 24, Helsinki to New York, special depart cachet, b/s, registered (label) airmail etiquette cover. F/F Helsinki-Copenhagen, b/s, special depart cancel, air cover, Aero A/Y. 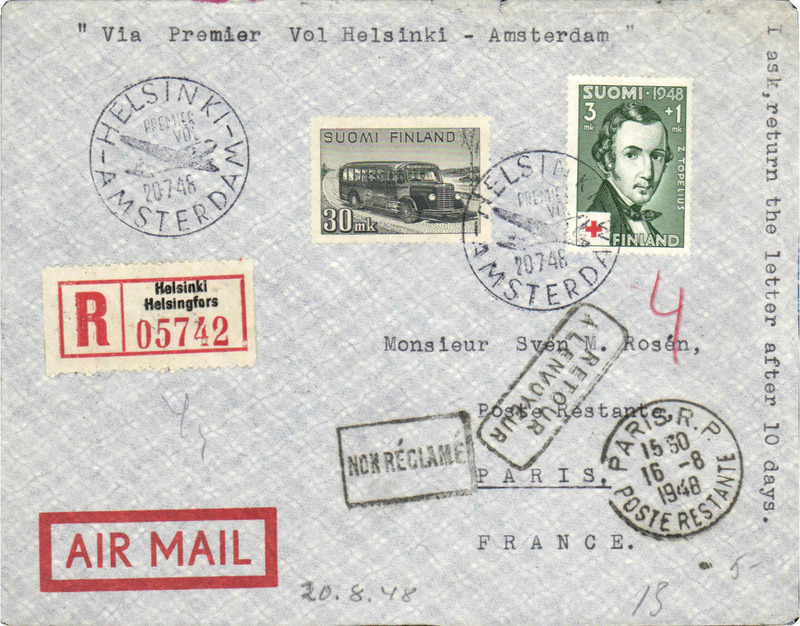 F/F Helsinki-Amsterdam, b/s, and on to Paris, 21/7 transit cds, special depart cancel, reg (label) cover, Aero A/Y. 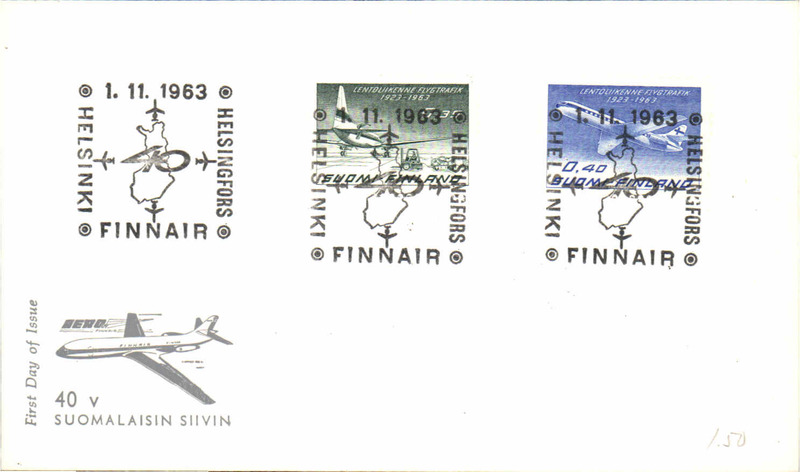 Finnair F/F Helsinki to Helsigfors -(London), b/s, souvenir cover franked 25o, canc special depart cds . 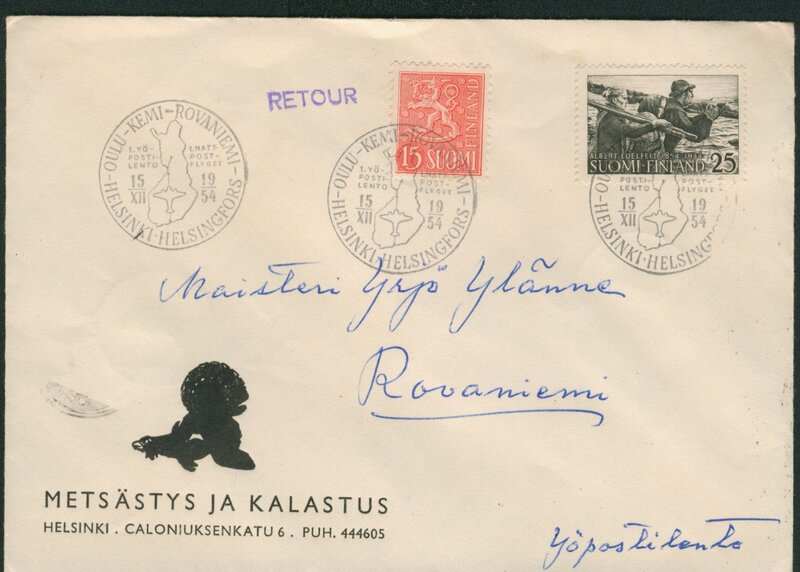 First night airmail, Helsinki-Rovaniemi, b/s, and return 17/12, printed souvenir cover franked 45o, special depart cachet. 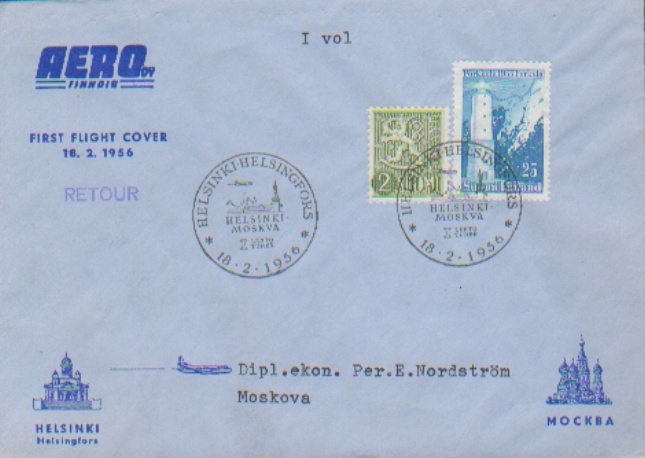 Finnair F/F Helsinki to Moscow, b/s, printed souvenir cover franked 27o, special depart cds. 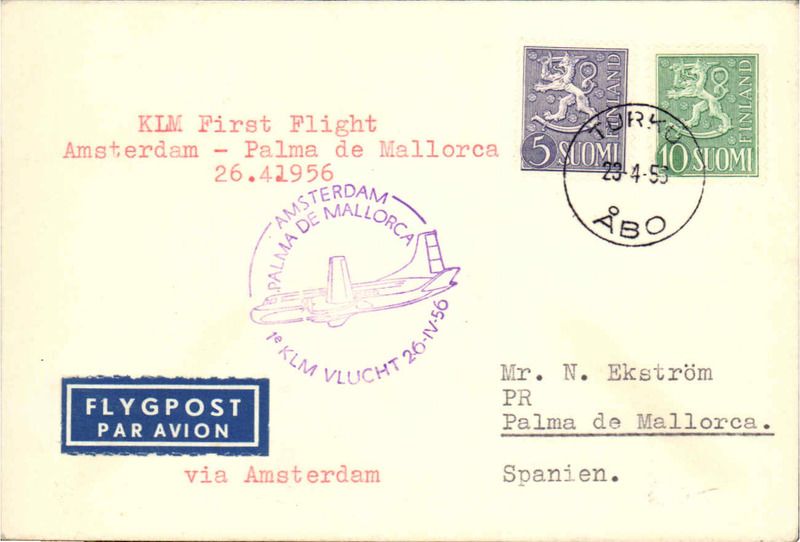 Finand acceptance for KLM F/F Amsterdam-Palma de Mallorca, franked 15s, canc Turku, 24/5 cds, cachet, b/s, souvenir cover. 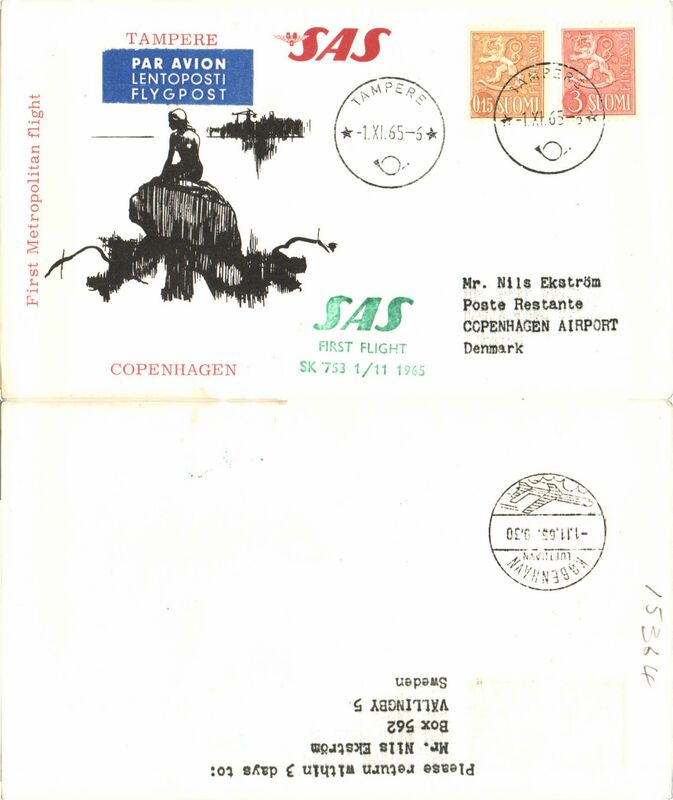 SAS F/F Abo-Copenhagen, bs, cachet, souvenir company cover. 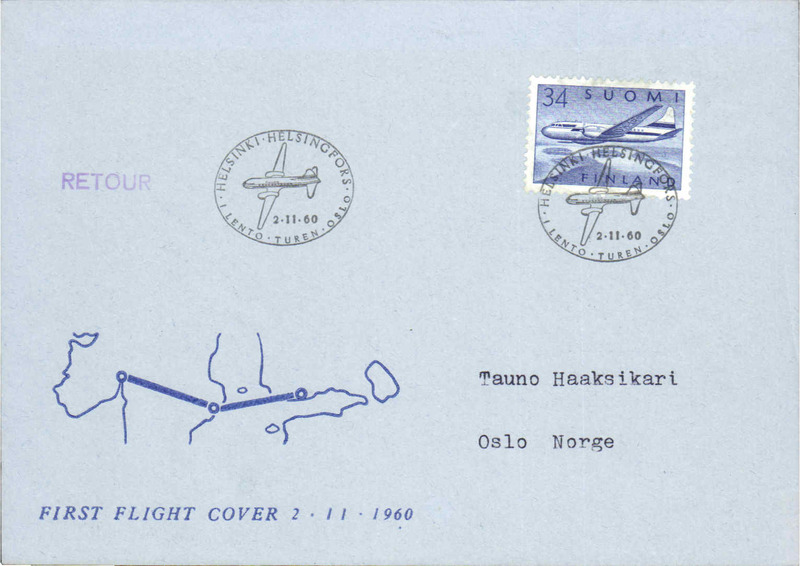 F/F Helsinki-Oslo, special depart ds, b/s, souvenir cover, Finnair. FDC 40 Years Finnish Aviation, special depart PM. 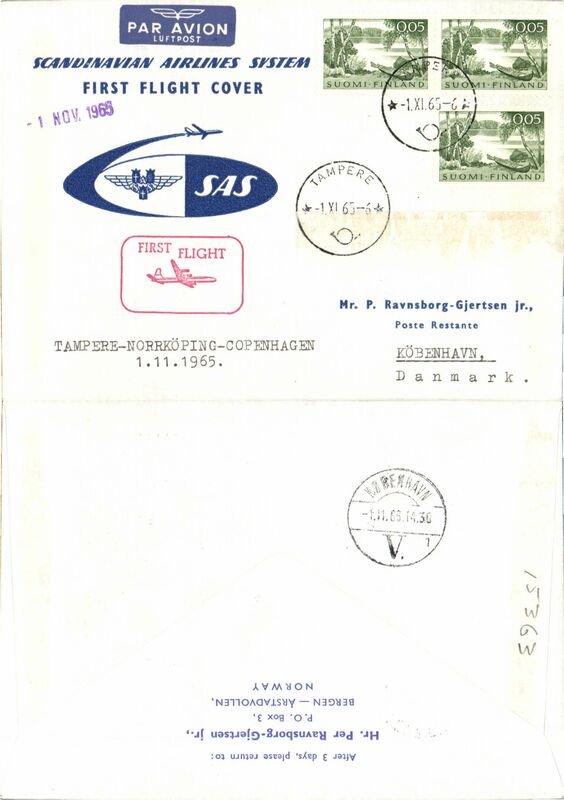 SAS F/F Tampere-Copenhagen, bs, cachet, souvenir company cover. 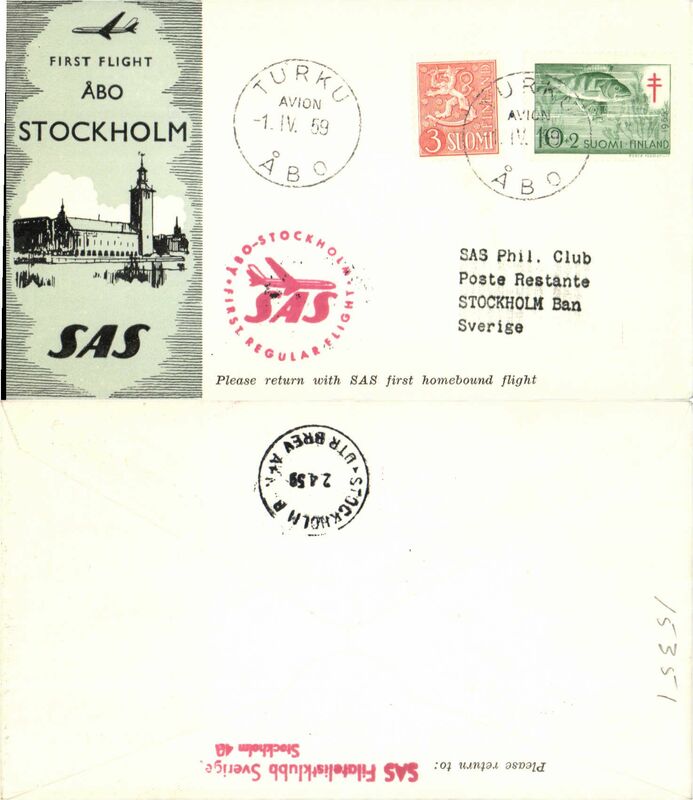 SAS F/F Tampere-Copenhagen, bs, cachet, souvenir card. 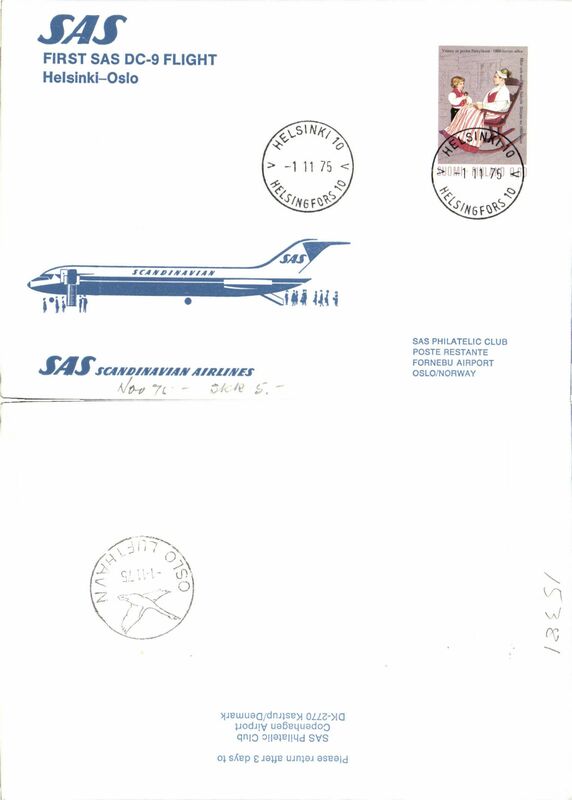 SAS 1st DC9, Helsinki-Oslo, bs, souvenir cover.